The Training Course “Social Inclusion Through Arts”, also knonw as SITA, was held in Zaragoza (Spain) from 20th to 26th October 2017. The project took place both at the accomodation site, the ancient Hotel Horus, and the CIEM coworking bulilding, where Mundus Zaragoza headquarters are. SITA was the result of a follow-up work on another Erasmus+ funded Training Course in Croatia. SITA has been the product of the collabotation between Mundus Zaragoza Association in Spain and Udruga Mladih Device association in Croatia. SITA project hosted a total of 21 participants from 10 different countries: Spain, Croatia, Greece, Italy, Slovakia, Bulgaria, Romania, Hungary, Portugal and Poland. The participants were chosen in regard of their experience among youngsters, especially towards social inclusion, and their interest and willingness to learn about new methods for inclusion, using arts and digital competences as a vehicle. 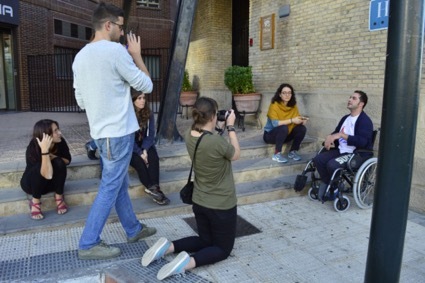 The project had also the support of the current EVS volunteers in Zaragoza, who helped with logistics and participated in most of the workshops. The main objectives of the project were: 1) To raise awareness on the state of art of social inclusion in other countries through participants’ interaction, offering them a chance for networking. 2) To share knowledge and learn skills for the daily job with young people with fewer opportunities through the transfer of practices that can boost participation and inclusion in the local communities. 3) To provide youth workers creative methods for workshops and digital methodologies to reach and involve young people at risk of exclusion. On the first day, the sessions started with some ice-breakers and name games to get to know each other. 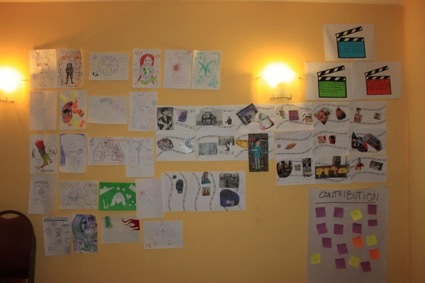 After the pretentation of the project, its objectives and the planned schedule fot the week, the participants could share, through a collective collage, which were their fears, expectations and foreseen contributions to the project. 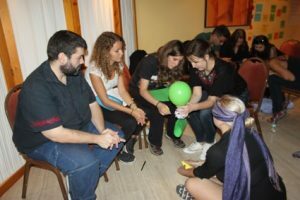 To work on the group’s cohesion and build the team, two activities were carried out on the first day. The first one was called “Get to draw each other”, in which the participants, in pairs, drew each one’s main features and likes so other could better know who they are. On the second one, participants in groups had to cooperate in order to build a device, but having a team member taken one specific ability that made the work even harder. 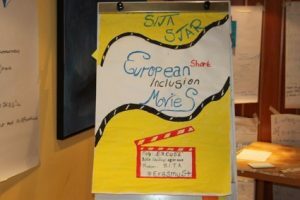 The second day was dedicated to get into the topic of social inclusion.First, there was a workshop for the group to define what social inclusion is for them and for the European institutions. The second activity had much to do with theatre and argumentation methods; it was the “Criss Cross debate”, a roleplay in which the participants had to either support or refuse a controversial motion in court, even though they wouldn’t agree with the role given. Afterwards, they performed “The Forum”, an activity against online hate speech that helped them understand how it is to be mistreated or set aside by the “insiders” of a mainstream social group. Those three activities led to very fruitful debriefings and debates that made the group share and learn the features and difficulties that come up when working towards social inclusion. On the third day, the work was focused mainly on the single art of photography and how to use it to foster inclusion. 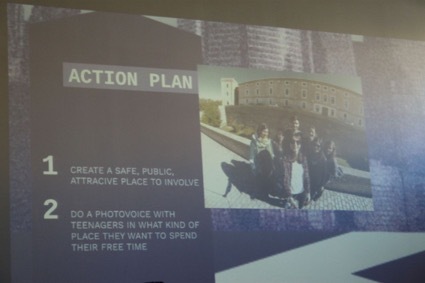 The metodology “Photovoice” was the one chosen to make the participants present a specific social issue taking and combining their original pictures. Topics such as accessibility on the city, abandoned sites and their usage, or public space and children were brought up. The last session was dedicated to choose the topic of the main outcome: a short movie about social inclusion they would have to carry out as a group. On the forth day a study visit took place. The group went to “Proyecto Hombre”, a well known Spanish NGO that works with drug users. Proyecto Hombre’s president explained what is the pattern they established to work with that target group and what kind of workshops (especially related to painting, music or theatre) they carry out. The rest of the day was dedicated to produce the final movie. The aim of the activity was, on the one hand, to acquire the necesary skills for developing an idea from scratch in a creative, audiovisual form. On the other hand, the movie making was an opportunity to experiment inclusion inside the very group. This task was, at some points, difficult to achieve, since the group was working together as a whole and they had to make sure that everyone was included in the process. Besides, there were limitations on time and resources to complete the task, what made the planning part even more challenging. After a discussion, every task needed was defined, and everyone had a role to fulfil. There were producers, storyboard makers, scriptwriters, a location-set team, music and sound producers, camera people, a make-up artist, actors and actresses, a time-manager and editors. Then the shooting started. At that point, the team had been able to overcome the problems that had come up, such as the challenge of getting a wheelchair in a city they didn’t know, or how to deal with the lack of light or the sound flaws during the recording. Eventually, they brought the raw material to the editors and helped with the edition process. 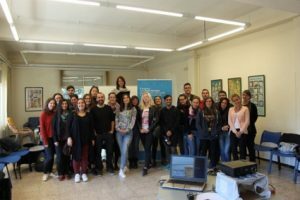 The last morning session of the project was dedicated to improving the awareness on Erasmus+ framework and the participant’s associations through a workshop and an NGO fair. After that, the participants had the chance to work together to create plausible future European projects and collaborations networks to work on different topics they are keen on. The afternoon session was focused on the final evaluation of the whole project and feedback giving, using different methods and activities. At the end of the day, it was time for the movie première and the last group gathering at the venue.